While walking around a stretch of Emerald Lake in Yoho National Park, British Columbia, on September 7th, we encountered a handsome caterpillar on a fireweed plant (Chamaenerion or Chamerion or Epilobium angustifolium). 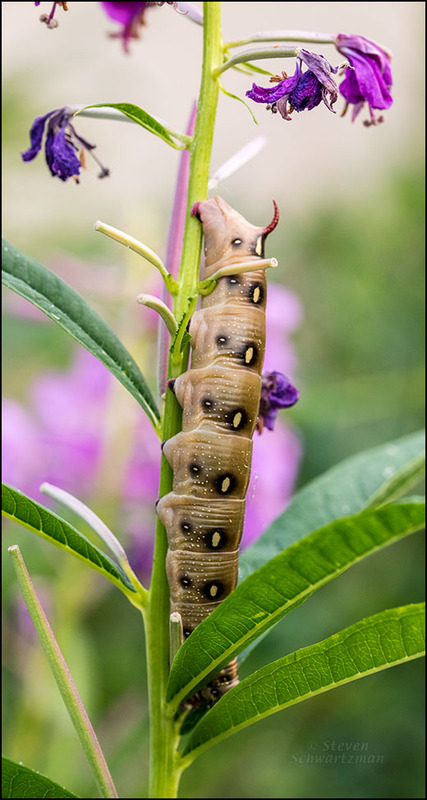 A member of bugguide.net identified, and another at Butterflies and Moths of North America later confirmed, my subject as the larva of Hyles gallii, a type of Sphinx moth known as a bedstraw hawkmoth. A few of you may remember the forlorn Hyles lineata moth that appeared here in 2012. In the greenbelt off Taylor Draper Ln. 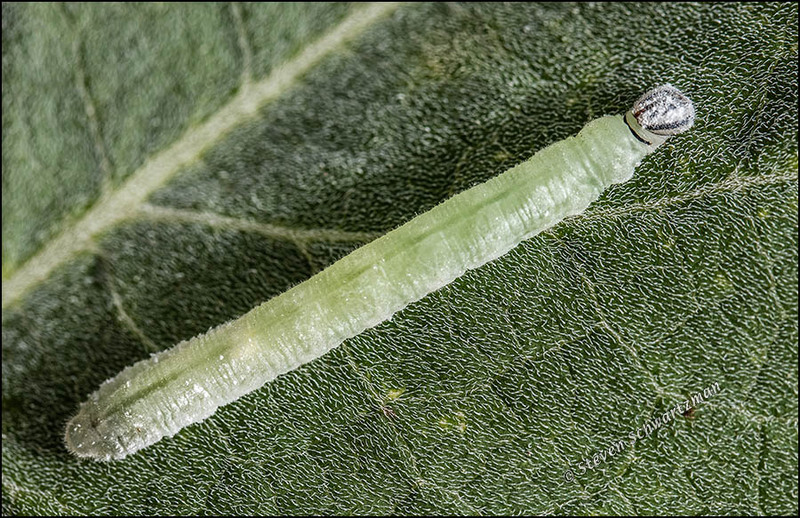 on October 7th I found what I think is the larva of a moth on a leaf of what I know is a buffalo gourd vine, Cucurbita foetidissima. You’re looking at a flower head of Berlandiera pumila, known as soft greeneyes, and a glance at its central disk explains the second part of that common name. When I prepared this post I originally wrote “I wish I had a name to give you for the colorful moth,” but since then the good folks at BugGuide have identified this as Schinia volupia, called a painted schinia moth. 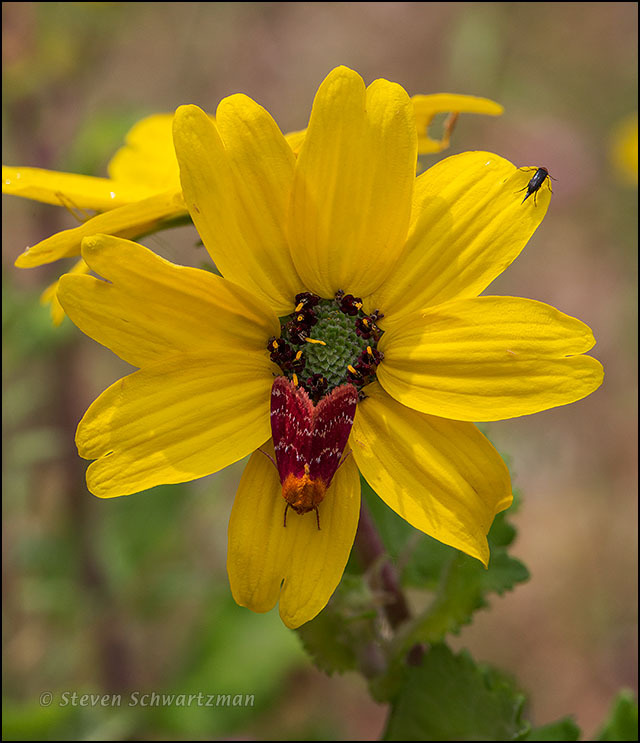 Apparently insects in the genus Schinia are known as flower moths, and they’re in the family Noctuidae, whose members people refer to as owlet moths. The tiny insect in the upper right is some kind of tumbling flower beetle. 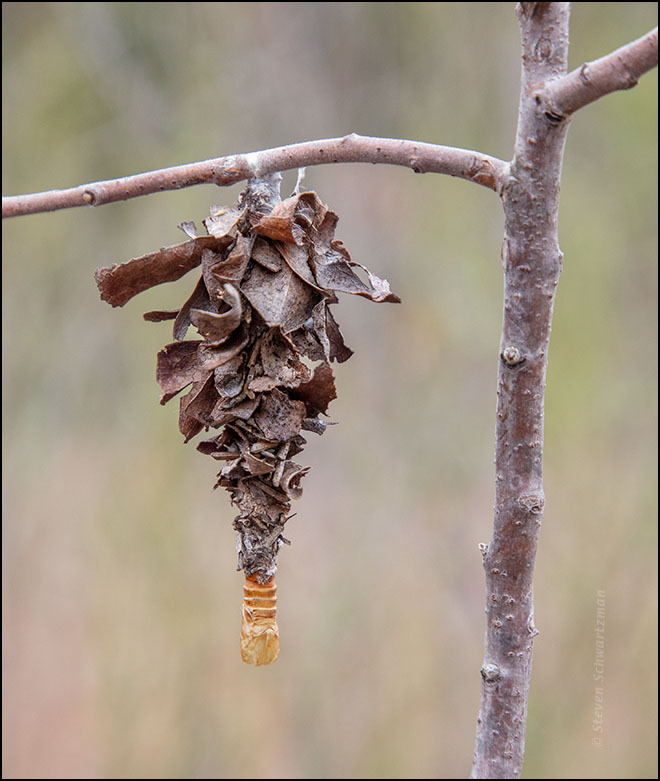 Like the last several photographs, this one comes from an April 27th field trip to Bastrop State Park led by botanist Bill Carr. Near the end of my December 18th walk in the Upper Bull Creek Greenbelt I noticed this tufted moth on a grass seed head. Wouldn’t you like to have antennae like those? As I wandered along the trail on August 19th at Hamilton Pool Preserve, not only did I see an orange butterfly, but also a bunch of orange-collared moths on some Eupatorium serotinum, a white-blossoming member of the same tribe, Eupatorieae, as the blue mistflower that was blooming nearby. 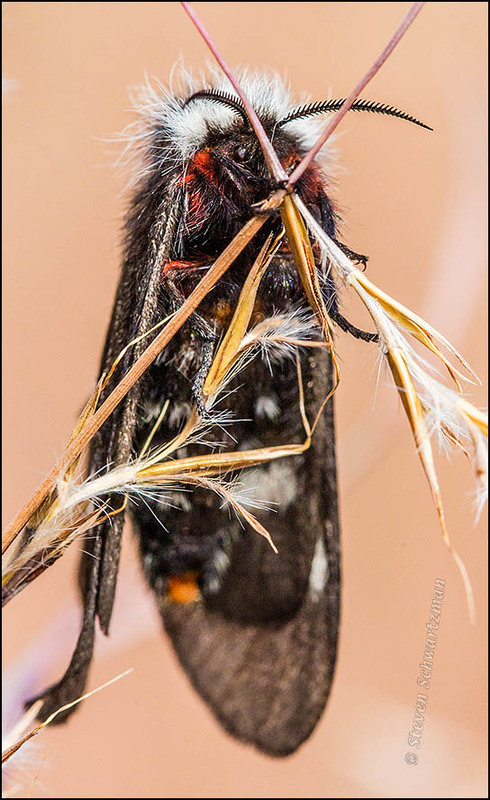 From what I’ve found online, this kind of moth might be Cisseps fulvicollis; on the other hand, it looks like it could be Ctenucha virginica; but then again, it also resembles Acoloithus falsarius (except that in that species the orange collar is supposedly bisected by a strip of black). Entomologists, feel free to lend your expertise to, as Wikipedia likes to put it, disambiguate the situation. For the technically minded: this moth kept moving around on the flowers, so I used a shutter speed of 1/500 sec. to stop the action. Because the insect was in almost constant motion, I didn’t have the luxury of taking time to align the camera’s focal plane with as much of the moth’s body as possible. Faced with that difficult situation, I kept my focus on the bright orange patch on the back of the moth’s head, knowing that other parts of its body wouldn’t be as sharp. When I was tramping about in the large field of goldenrod at the corner of E. Stassney Ln. and Burleson Rd. 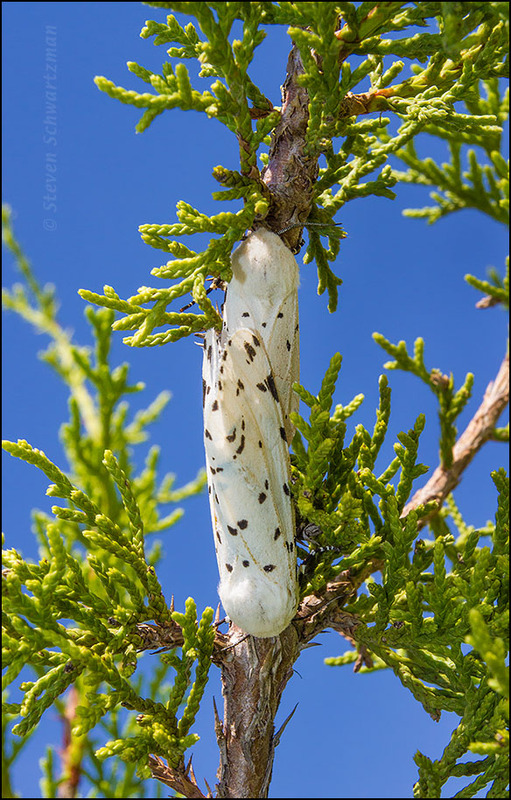 in southeast Austin on October 1st, I came across a narrow white moth with black spots that was on a young Ashe juniper tree, Juniperus ashei. I took a bunch of pictures of the unknown (to me) moth, and later I did an Internet search to see if I could identify it. 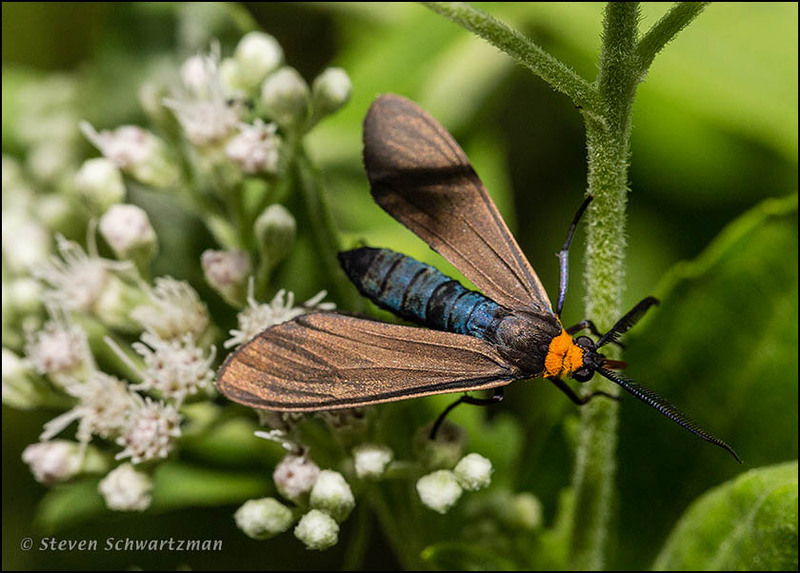 Only when I looked at the first picture on the left in the Wikipedia article about the salt marsh moth, Estigmene acrea, did I realize that in fact I’d photographed two moths mating; in looking at my own pictures, I’d noticed the antennae at the top but not at the bottom. Unobservant me. But the moths were caught up enough in what they were doing that apparently neither of them noticed me, so I guess we’re even.